Last Tuesday saw events that have since reverberated and escalated in Turkey. Two armed men claiming to be with an outlawed leftist political party called DHKP-C entered the largest courthouse in Europe a couple blocks from my apartment. They took hostage the prosecutor pursuing the case of a teenager who was hit with a tear gas canister in the Gezi Protests in 2013. He was sent into a coma and died nine months later. The militants claimed the prosecutor was dragging his feet on the case. Their actions did not do much to ease public perception of the alleged terrorist group. One of the first things the militants did was hack a Twitter account and post a picture of the terrified lawyer, gun pressed aggressively against his head. The walls of the room had been draped with the flag of the DHKP-C. It was clearly meant to terrorize and send a message beyond this one case. (I’m not providing a link to the picture for reasons to be explained.) They demanded all accused and unaccused police officers record their confessions to the boy’s murder within 3 hours. If at 3:36 pm their demands were not met, the prosecutor would pay the price. Several news publications published the picture from Twitter on their platforms. The Turkish government immediately imposed a media blackout. Many have been to quick to judge this as another example of outrageous censorship. Journalists, especially TV reporters, have a tendency to pass on any and all information they learn to the newsdesk as soon as they learn it. All power and communications were still working in the building – there were courthouse employees still walking the halls, even as a military operation took place in the building. The militants could access the internet and TV and learn about whatever plans were being concocted against them outside – if there were journalists to put it on the internet or TV. A media ban in these cases is almost standard procedure. Reporters outside the building still relied on intel that came from mostly the police chief and ultimately knew very little. Still, it is absolutely reasonable to prevent the militants from knowing too much by censoring the militant’s sources of knowledge for a short period of time. What wasn’t standard procedure were the actions the government took after the situation ended. But first, to minimize the risk that you misinterpret where my values lie, I will not pass over the horrid and unfortunate violence that ensued and killed all three involved, six hours after the stated deadline. The press conference afterwards was also not without its share of screamed political slogans and thrown fists. The next day, the government began an investigation into four newspapers for publishing the photo of the prosecutor with a gun to his head. The stated reason was for “spreading terrorist propaganda,” while Prime Minister Davutoğlu also used words like “immoral” and “indecent.” President Erdoğan has gone as far to say that some media organizations were partners with the gunmen in the prosecutor’s death. 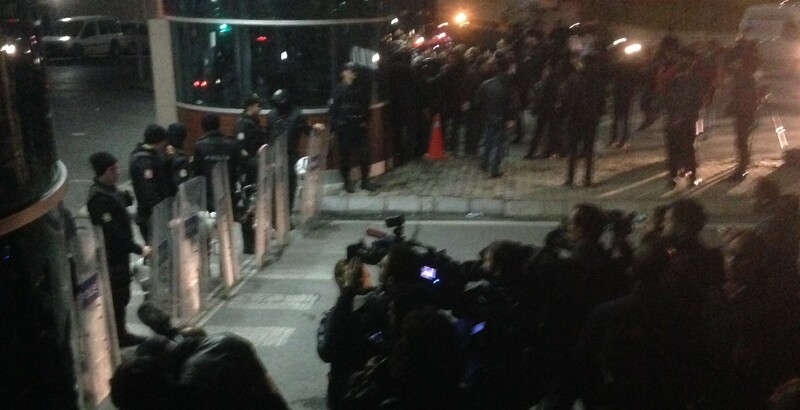 Reporters from the popular newspaper Hürriyet were banned from entering the funeral of the prosecutor. And then, on Monday, Twitter, Facebook, and YouTube were banned on several service providers. I couldn’t access Twitter or YouTube in my apartment without going through a proxy. As soon as all three complied with a court order to remove the picture from their platforms, the ban was lifted. On Tuesday, Google complied with the order and removed all links to the picture. I can’t find the picture now when I use some internet providers. Imagine if Google, the fourth-most valuable company in the world, had been blocked like the other media giants. That would have gone down in history. Turkey threatened the websites with losing an entire country’s market for one picture. A traditional media ban would not censor content that the militants already knew. The publication of the picture may have actually been able to help the situation. There are conspiracy theories that the government was actually behind the attacks (there were three more violent events involving the DHKP-C the day after the prosecutor’s death). Elections are coming in June. A year ago, the government also blocked YouTube and Twitter in the run up to local elections. The prosecutor was also shot five times, but only 3 loud explosions from a handgun could be heard from outside the building. The rest were shots from the Turkish police. But there are always conspiracy theories in Turkey. What seems to be true though is that the government is taking full advantage of the situation handed to them. They were able to launch large-scale investigations into four newspapers that they have never particularly gotten along with. They were able to exert their authority over a formidable, and in their view competing, force. And all the while, they were able to promote extremely anti-terrorist propaganda with a skewed definition of terrorism. US government propaganda is virtually unheard of or ineffectual. Turkish government propaganda and the power of its reception is without equal.